The reincarnation of King Crimson in 2013 was a pleasant surprise to the prog community. The new line-up consisted of three drummers Pat Mastelotto, Bill Rieflin and Gavin Harrison, Mel Collins on wind instruments, Tony Levin on bass guitar, Jakko Jakszyk on vocals and guitars and Robert Fripp on guitars, and would focus mainly on the United States and Great Britain. However, I think many European fans like me eagerly awaited the moment till concerts on the European mainland were announced. At the beginning of 2015 this moment was finally there, when three dates in Paris and two in Utrecht were announced. Since then, I had been looking forward for this unique event and I was very excited when the big day was there. The concert would begin at 8:00 PM, but after the lights dimmed, nothing more than pre-recorded soundscapes were played for over half an hour. This became annoying, especially when the lights went on again. Finally, Fripp's well-known request not to film or photograph the show sounded, after which the seven men, neatly dressed in suits, entered the stage, followed by a loud and long welcome applause. After a short and restrained improvisation, Fripp played the familiar crescendo guitar of Larks' Tongues in Aspic (Part I). What a great opener and what an energy! While Fripp was playing in darkness during the previous visit of King Crimson to The Netherlands in 2003 (see flashback), he was clearly visible now, still playing ferocious riffs and solos. Jakszyk has a great voice and added a fresh touch to the old songs. 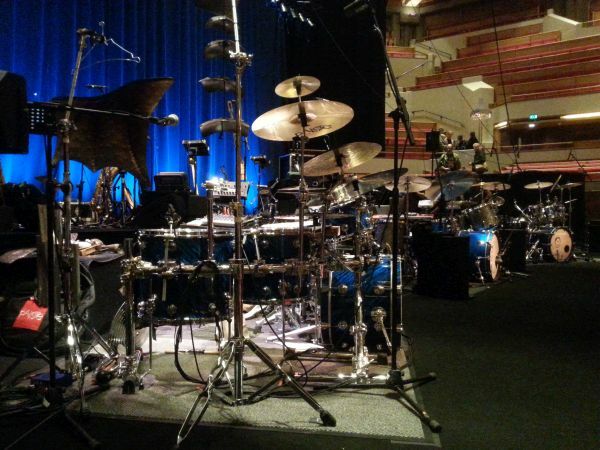 Tony Levin, as always, laid the fundament and also played sophisticated embellishments. Collins played a wide range of flutes and saxophones and greatly enriched the arrangements. Main asset of this line-up is of course the frontline with three drummers. Their coordination was amazing, sometimes playing powerful unison rhythms, sometimes cleverly dividing beats and sometimes each focusing on different rhythms / parts of the drumkit (with Mastelotto producing the strangest and most improvised sounds). The focus of the first half of the concert was clearly on new material. This was strong as ever, but absorbing so much new music made this also a demanding listen. I must admit I was a bit jealous when I read afterwards that those who attended the concert on the previous night were treated to songs like One More Red Nightmare and A Scarcity of Miracles. Then Level Five was played. I wrote that this piece of music sounded very powerful back in 2003, but this line-up brought it to a whole new eh... level. This was the first real highlight of the show and was followed by a great ovation. Easy Money made a welcome appearance, one of the few more catchy melodies, while of course still featuring the Crimsonesque complexity. Euphoric moments followed quickly now. The intro of Epitaph sent shivers down my spine and left many middle aged men in tears. During this song and others, Rieflin played mellotron sounds on his keyboard. A wise decision, because in some songs these sounds are more needed than a third drummer. The ending section was still a bit too percussion-heavy for my taste. Led by Tony Levin, the band really grooved in The Talking Drum, which was immediately followed by a thundering version of Larks' Tongues in Aspic (Part II). By now, over two thirds of the Larks' Tongues in Aspic album had been played! The main set ended with the mighty Starless, which again sent shivers down my spine. After a long ovation, the band returned and showed (and received) some more love for their legendary debut album In the Court of the Crimson King with a flawless performance of the title track. It got even better though, with the final song 21st Century Schizoid Man. The precision of the unison lines was literally jaw-dropping and if that wasn't enough, the performance featured a fantastic solo by Harrison. It was clear that this climax couldn't be topped, so the concert was over. This was an amazing concert, one of the best and most memorable I have attended. 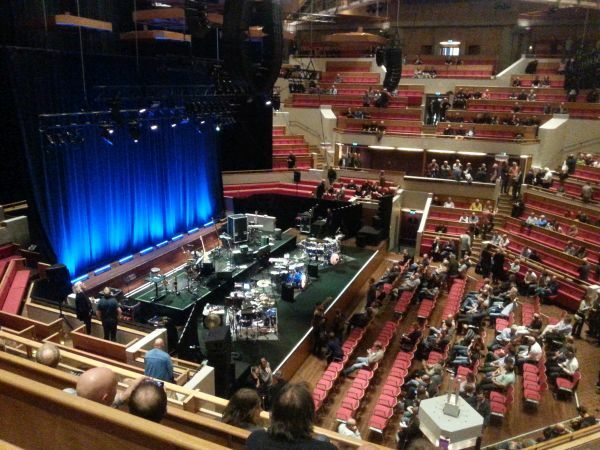 If this would turn out to be the last visit of King Crimson to The Netherlands, they said goodbye in style. I hope they will return once more though!